Chobe National Park is Botswana's third largest park at 11,700 km², named for the Chobe River, a tributary of the Zambezi, which forms the park's northern edge. The river forms a permanent water supply, giving Chobe the largest population of elephants in Africa, with some 100,000 individuals. River cruises here allow you to spot large elephant herds drinking from the river in addition to hippos and a myriad of birdlife. The park's other animal species include buffalo, kudu, zebra, puku, Chobe bushbuck and the big cats. The south-western corner of Chobe is known as the Savuti Marsh, a grassland that has been dried up for years. Three pumped water points provide excellent opportunities to view herds of elephant, buffalo and antelopes as well as the predators that pursue them. 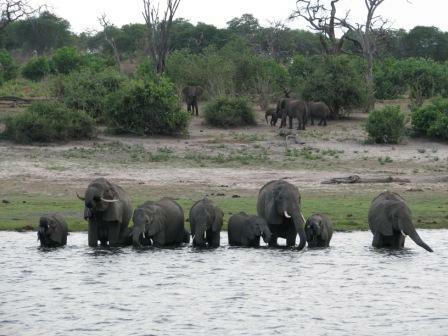 Organised group tours: Click here to see 9 tours to Botswana which may include Chobe National Park.